60 years ago, on the initiative of Arnulf Erich Stegmann, 16 founding members met in Vaduz to hold the first general meeting of the Association of Mouth and Foot Painting Artists of the World there. In this way, not only was the Vereinigung der mund- und fussmalenden Künstler in aller Welt (VDMFK) founded, but this moment was actually the start of a success story which, with currently around 800 artists in 74 countries, has nowhere near yet reached an end. At the time, Arnulf Erich Stegmann was himself already a recognised artist, and he wanted to enable other people who, like him, were only able to paint with their mouth or foot to share this experience. After the bleak years he had lived through in Germany, he found an oasis of peace, safety and stability in Liechtenstein, making it the right place to establish a self-help organisation which even 60 years later is still in a class of its own. Under the heading “Timeline” you can find out more about the history of the origins and development of the VDMFK. In the meantime, this independent self-help organisation has grown to 800 mouth and foot painters from more than 74 countries. Despite great obstacles, thanks to the VDMFK they have all found access to art. With this new perspective, they strive every day to demonstrate their painting skills again and again, and thus support this self-help organisation with dignity and consideration. 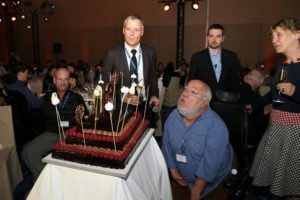 On the occasion of the 60th anniversary celebrations, a plenary meeting and elections for the Board members were also held in Barcelona in April 2017. The mouth and foot painting artists have always elected their President and Board members themselves, and they also decide on the key strategic decisions of the VDMFK. 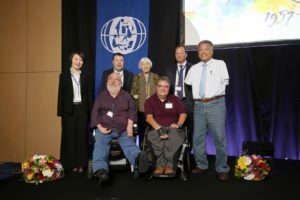 Following the death of Board member Trevor Wells from New Zealand and the age-related retirement of Mr Manuel Parreño from Spain, eight members from four different continents stood for election to these two seats. On 11 April 2017, 99 mouth and foot painting artists elected Ms Soon-Yi Oh, a foot painter from South Korea, and Grant William Sharman, a mouth painter from New Zealand, onto the Board of the VDMFK. Together with the other six Board members, they have the task of defining the VDMFK’s business policy for the next six years, an honourable but also extremely challenging task. The management congratulates the two new Board members on being elected and wishes them both much success. 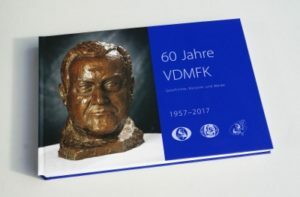 As well as the plenary meeting, between 9 and 14 April 2017 there were also celebrations of the 60th anniversary of the VDMFK. On the Monday evening the newly-published book “60 Jahre VDMFK – Geschichte, Künstler und Werke ” 60 Years of the VDMFK – History, Artists and Pictures, ” was also presented. This highly attractive book is published in four languages, and can be ordered directly from the VDMFK or via the collaborating publishers. Time and again occasions of this kind offer the artists from all over the world an opportunity of exchanging views with like-minded people and making acquaintances for life. A highlight of this week was the opening of the exhibition of the mouth and foot painting artists’ work in the Museu Marítim de Barcelona. 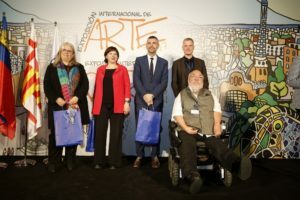 The well-known journalist Glòria Serra welcomed the mouth and foot painting artists. Amongst other things, the opening speech was given by the Catalan Culture Minister Santi Vila i Vicente and all the honorary guests were presented with a gift copy of the 60 Years book. 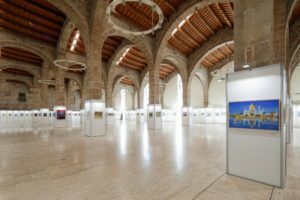 200 pictures painted by mouth and by foot were presented to the public in the beautiful Marques de Comillas hall. The exhibition lasted from 12 to 17 April 2017, and attracted the interest of thousands of visitors. The culmination of the week was an excursion by the mouth and foot painting artists to the neighbouring Penedès sparkling wine region, an ideal location for bringing an unforgettable week to a close together.